204 Events was founded by Alton Butler who hails from the great state of Alabama. The south is our culture and in the south, we drink Southern Sweet Tea. From our hearts to yours—204 Events. Boil one quart of cool filtered or bottled water, bringing to a full, rolling boil then turn off heat. Steep tea bags in the hot water for 9 minutes. Gently squeeze bags of excess water and remove. Whisk in sugar (and baking soda if using) until dissolved and set aside. Fill pitcher with ice, and carefully pour the hot tea concentrate over the ice. 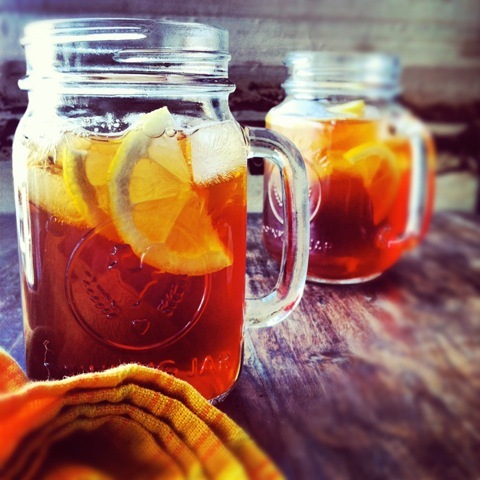 Stir well and pour over ice filled mason jars, garnishing with a sprig of mint leaves and a nice juicy slice of lemon. Savor. Makes 2 quarts. Enjoy this recipe with some friends. Cook’s Notes: For a milder tea, use 5 bags; for a more robust tea, go with 7. Increase sugar as needed to your sweetness level. Never pour hot tea directly into a glass pitcher without ice in it! To conserve your ice and use the tea per glass, fill the 1/2 gallon pitcher with 1-1/2 quarts of water instead of ice, and top with the steeped tea. 1. For perfect tea always start with fresh filtered cool water – never tap water! 2. Cloudiness is often caused by putting hot or still warm tea directly into a cold refrigerator. My method prevents this since you are pouring your steeped tea directly over ice cubes. 2. Bitterness in tea is caused by overcooking and burning the tea leaves – that is why it is important not to boil the teabags and not to steep them too long in boiling water. To counter, a pinch of baking soda – only about 1/8 of a teaspoon – can be added to the hot, steeped tea after you remove the bags. It will not affect the taste of your tea, and provides insurance against bitterness. 3. Use wooden spoons to squeeze your tea bags, a glass container – like a large Pyrex measuring cup – to steep your tea, and store it in a glass pitcher if at all possible. 4. 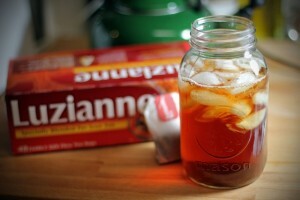 If you prefer your sweetened tea more on the sweet side, increase the sugar. Some folks like as much as 1-1/2 cups of sugar, but start lower and increase for the next pitcher.5. If you like lemon in your tea, try making ice cubes out of lemonade to use in the individual glasses. As they melt, they will infuse the tea with lemon flavor!